Seals belong to a group of mammals called Pinnipeds, which means “wing-footed”. In Ireland we have two species of seals of the 33 species of Pinnipeds scattered across the world, the Grey seal and the Common seal. Seals are beautiful unique mammals that share their time between the land and the sea. Seals can be grouped into three categories, True seals (Phocids), Eared Seals (Otariids) and Walruses (Odobenids). Both the Grey and Common seals are known as True seals. The main difference between True and Eared seals is that True seals lack an external ear, they just an opening on the side of the head. True seals are also clumsier on land using their bodies to bounce along the ground, whereas eared seals are able to use their larger flippers as limbs to walk on. Walrus are the only remaining members of the Odobenids and are easily recognised by their characteristic tusks. Can you spot the similarities!? The Grey and Common seals live scattered along our coastline. The Grey seals like to roam around the North Atlantic during the year, travelling from one country to another, but returning to the same place each year to breed and give birth. They are found on offshore islands and on rocky beaches and coves. The Common seal travels less far, and can usually be seen in bays, estuaries and sheltered inlets. Seals feed underwater, hunting for their prey using sight, sound, and vibrations, picked up by sensitive whiskers called "Vibrissae". Their eyes are very well adapted for low light levels underwater, and they also have well developed directional hearing. Their teeth are sharp, like that of a typical carnivore, with incisors and canines for ripping and shredding, but they also have backwards pointing teeth used to hold onto slippery prey. 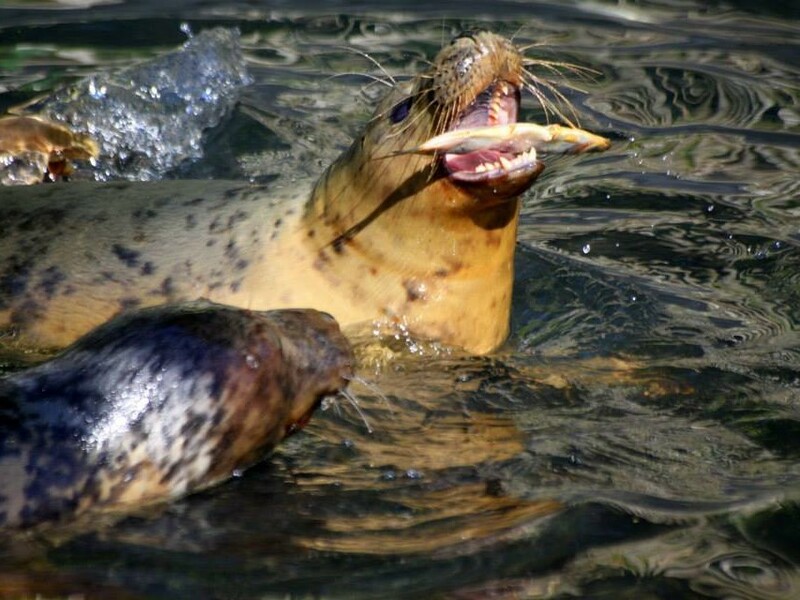 Seals feed primarily on shoaling fish like mackerel and herring, as well as crustaceans, squid and octopus. Seals are warm blooded. A smooth thick layer of blubber lies underneath the skin to regulate the seals body temperature and keep them warm, even in freezing cold oceans. Seals also have fur over their body to keep them warm. 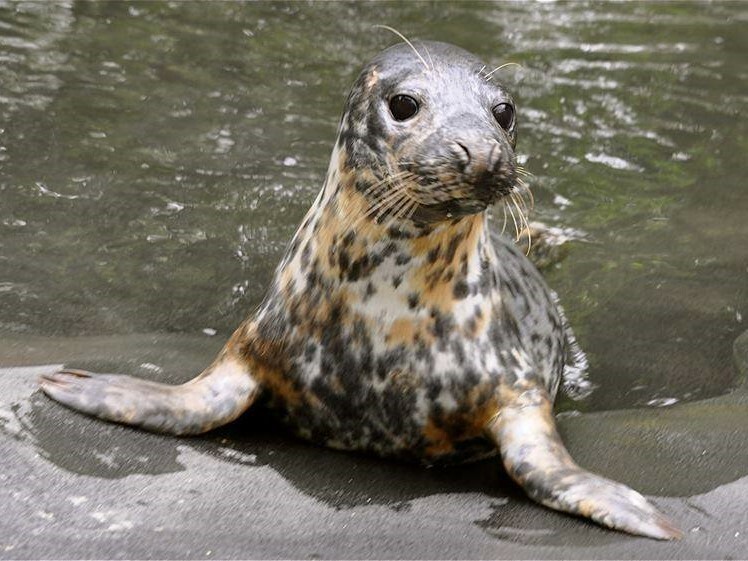 As seals are so well designed to retain heat, on hot days you may see them sticking their furless front or rear flippers out of the water to try and cool down! In hot weather, on land, seals can often be seen flipping damp sand onto their backs in an attempt to keep cool. Also dilation of the arterioles, particularly in the flippers, allows a rush of blood to the skin promoting cooling. True seals have specialised bodies shaped like 'torpedoes', with no obvious neck, no external ears or genitalia and reduced limbs and tail allowing them to swim fast to escape from predators or to catch prey. This body shape helps to reduce drag in the water which is 800 times denser than air. The streamlining is enhanced by the layer of blubber rounding off all bony protuberances. Seal are often referred to as the acrobats of the sea due to their agility in the water! They are able to swim effectively over very long distances achieving speeds of up to 25 knots. Their fore flippers are used primarily for steering, while their hind flippers are bound to the pelvis in such a way that they cannot bring them under their body to walk on them like fur seals or sea lions. However, as agile as they are under water, they are very clumsy on land, having to bounce and wriggle with their front flippers and abdominal muscles. Dives usually last 5 - 15 minutes and from 30 - 70 metres. The nostrils are kept closed during dives and opened on surfacing. Only a very short recovery period is needed between dives. Seals exhale on diving and the lungs and alveoli collapse at a depth between 25 - 50 metres, thus pushing any residual air into non-absorptive air spaces. This prevents seals from suffering from buoyancy problems and any risk of the bends. Seals restrict their seawater intake to avoid taking on excess salt. They primarily derive fluids from the food they consume, e.g. 90% of fresh water taken in by common seals is from the fish they eat and most of the remaining 10% is metabolic water and inspired water vapour. Seals kidneys are very efficient at concentrating urine. They produce urine that has a higher concentration than seawater. The eyes are large with a strengthened cornea adapted to the refractive index of water, and a retina adapted to dim light conditions, allowing good visibility underwater. They also have a protective third eyelid that wipes sand away and a continually produced tear film also helps to protect the eyes. On land, in brightly lit conditions, constriction of the pupil reduces light intensity, which in turn reduces the refraction of light through the lens, allowing the eye to effectively focus. Our seals have few natural predators. Killer Whales (Orcas) may take seals when in Irish waters though this is rare. People are the main threat to seals, which have been hunted by man for food for many centuries. Commercial hunting for skins reduced the population of Grey seals to only 500 individuals in 1914. This led to the 1914 Grey Seal Protection Act being introduced and another similar act in 1932. This means that it is illegal to kill Grey seals during their breeding season. In 1970, the current Conservation of Seals Act was passed which also covers Common seals giving a degree of protection as shooting is outlawed during the breeding season, however if a seal is deemed to be interfering with fishing nets, it can legally be shot at any time under the 'Fisheries Defence Clause'. These Acts have allowed the numbers of seals to increase, but has brought them into direct conflict with fisherman – leading to seal culls in the 1960’s and 70’s to reduce the population. 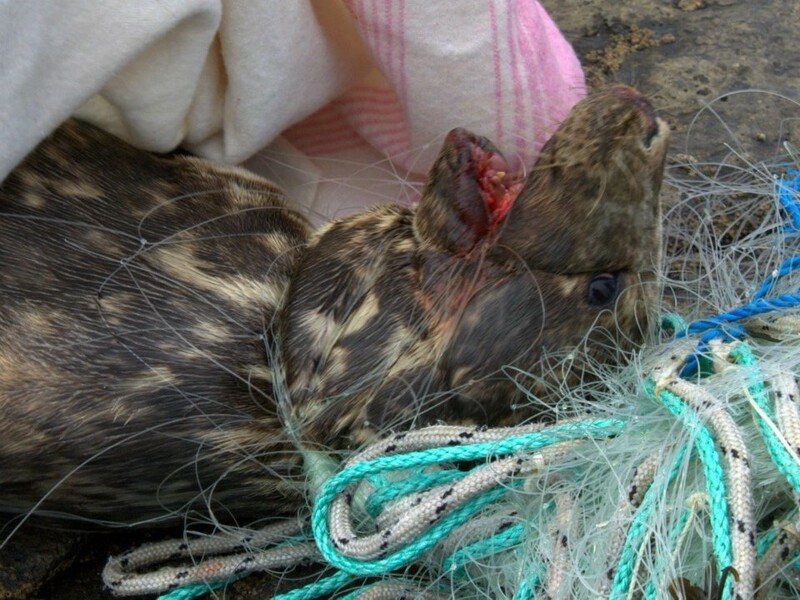 Although these culls were ceased in 1978, Fishermen may still legally shoot seals caught in or near their nets. Illegal culling is still a major problem and near impossible to police. 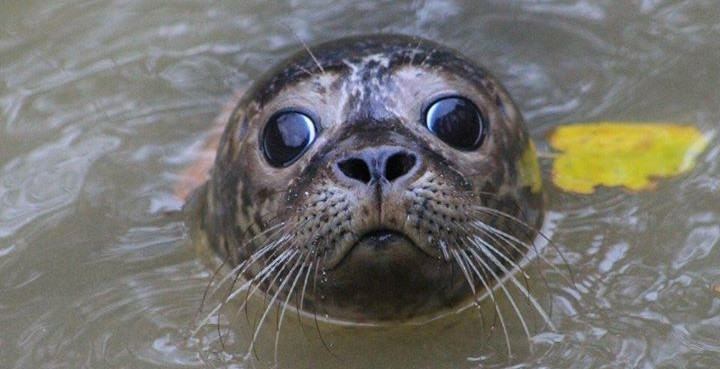 Naturally occurring diseases may sometimes pop up in seal populations, for example in 1988 a disease caused by the newly emerged phocine distemper virus killed about 3,000 of the UK's common seals. Such drastic population crashes seem to be a natural occurrence, and little can be done to prevent them. Both Grey and Common seals are sensitive to disturbance by people and dogs, particularly when pupping or feeding young on beaches. Unfortunately, mothers will often abandon pups if disturbed by humans or attacks by dogs, leaving the pup in danger and likely ending in the death of the pup. Most threats to Seals, along with all marine wildlife are sadly due to humans, for example susceptibility to oil and chemical pollutants. 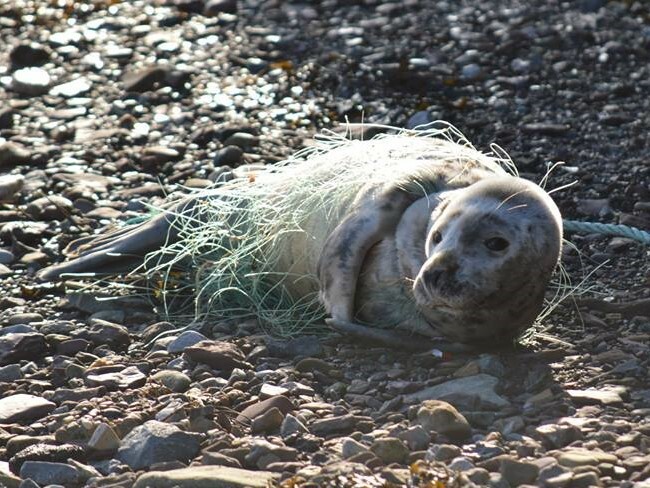 They can also often become tangled up in fishing nets, which may be fatal if they are caught around the seals throat, and as they grow and the net does not stretch, they are suffocated, a slow and painful demise. Scientific Name: Phoca vitulina. Also known as Harbour seal. Common seals generally start having their pups in the summer months of June and July, however we sometimes see early pups in May and then stragglers in August and September! Pups at birth are small at only 2 -3 feet (65-100cm) in length and weigh between 6-12kg. They are born with their adult coat having moulted the lanugo fur in utero (however somtimes if born prematurely the lanugo remains after birth). They recover quickly after birth and after their first suckle take to the water with their mother and can swim and dive straight away. They are weaned between 4 - 6 weeks of age, and have been known to stay around their mothers to learn how to hunt. Adult male reach up to 6.5 feet (1.9metres) in length and weigh up to 150kg – though larger dominant specimens have been seen before. Males have a shorter life span of up to 25 years. Adult females are smaller reaching 5.5 feet (1.7metres) in length and up to 100kg. Females have a longer life span of up to 35 years. Common seals are a protected species in Ireland, and are also a Priority species as their numbers have been slowly declining. Common seal status: Least concern. Estimated world-wide population of approx. 350,000 – 500,000 animals. Scientific name: Halichoerus grypus. Meaning "Hook Nosed Sea Pig". Grey Seals have a longer pupping season in Ireland; we have seen pups as early as August, however normally they pup between the winter months of October and February. Pups are born at around 2.5 - 3.5ft (90-105cm) in length and weigh between 12 -16kg. They are born with a white (lanugo) coat of fur, and stay on the beach for their first 3 weeks of life. While feeding from their mother the pups triple in weight and are then rapidly weaned at around 3 weeks of age which coincides with them moulting their white coat. Once weaned, pups are left to fend for themselves, and finally take to the water to learn how to hunt fish on their own. 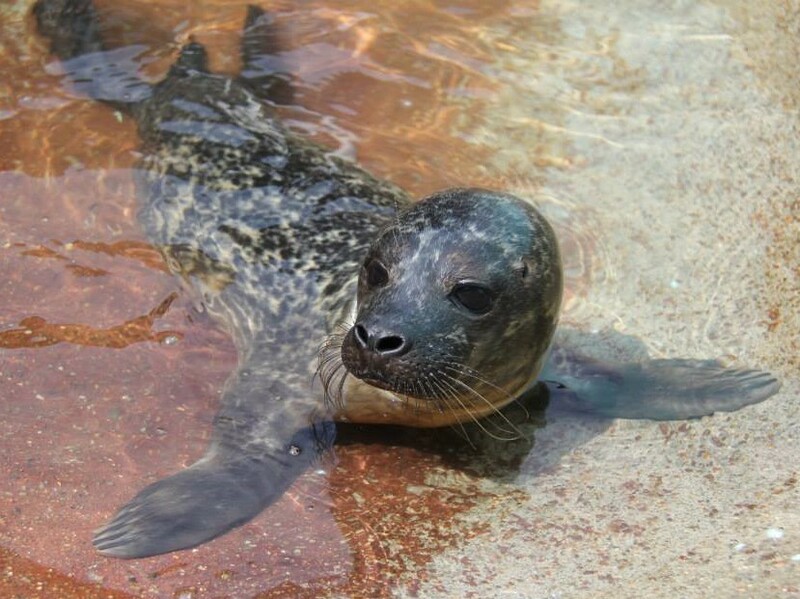 Grey seal pups have an extremely high mortality rate of up to 40% of pups dying depending on the season. Adult males reach over 2 metres (6.5 – 8 feet) in length and weigh in at over 310kg. Large dominant males have been sighted larger than this. Males have a shorter life expectancy at 25 years. Adult females are smaller at 1.8 metres (over 5.5 feet) in length and weigh on average 155kg. Female Grey seals live longer than males at around 35 years. Grey seal status: Least Concern.